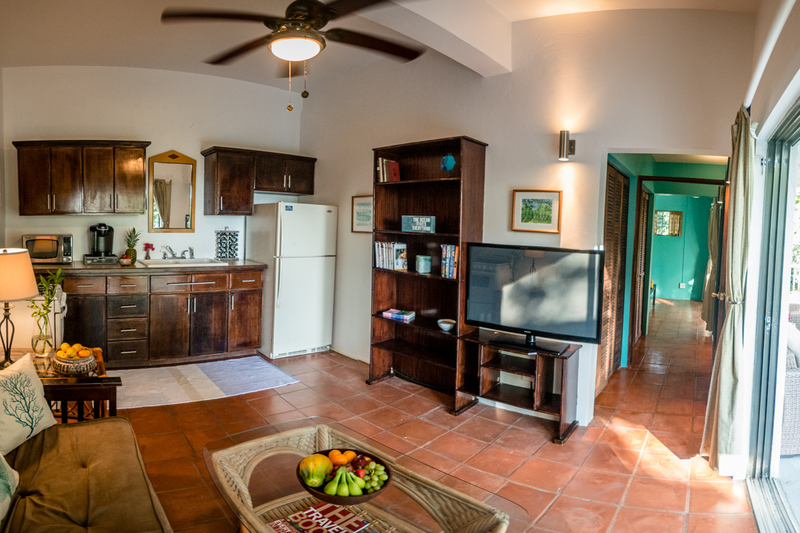 The Garden Suite at Chocolate Hole Bay is a private one-bedroom apartment suite located just outside of town in the quiet neighborhood of Chocolate Hole. It features a King size bed in its air conditioned bedroom and a full size futon in the kitchen/living space. 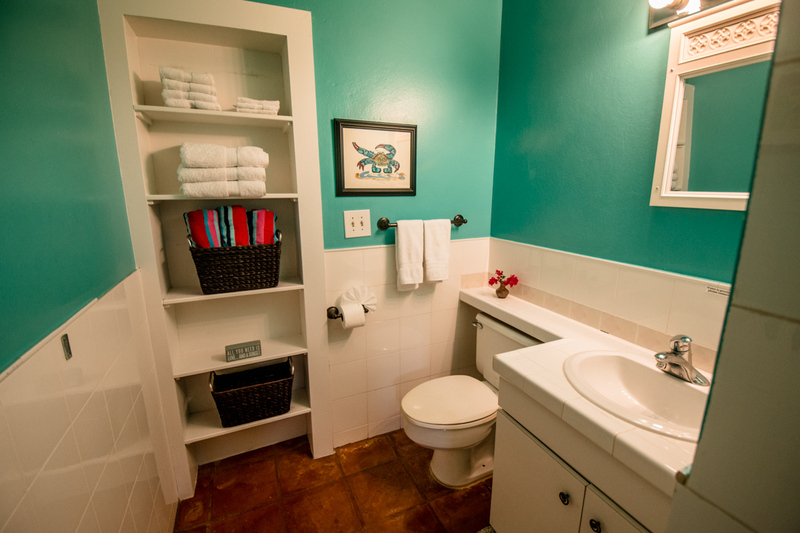 The Garden Suite is well equipped with a full kitchen and has wifi throughout, as well as a washer and dryer. The Garden Suite has an expansive outdoor living space affording guests the option to bask in the sun while looking at the waters of Chocolate Hole or relax in the shade while lounging on the suite’s comfortable outdoor furniture. And for those of you who like to cook out, the Garden Suite comes with your own Weber grill. The Garden Suite is surrounded by lush plantings, tropical fruit trees and native stonework. Depending on the time of year, you may be able to have a fresh papaya or banana plucked right from the property. When staying with us, you’ll have everything you need for an unforgettable vacation right at your fingertips. This includes coffee for your mornings, beach towels, beach chairs and a cooler for daytime fun, and comfortable outdoor furniture for you to relax on while watching the stars come out at night. The Garden Suite is located on the bottom floor of the Down Yonder Villa. But no need to worry, it has its own private entrance that winds down among the fruit trees and its own parking area as well. The Garden Suite is so private and quiet, you will feel like you are the only ones around. 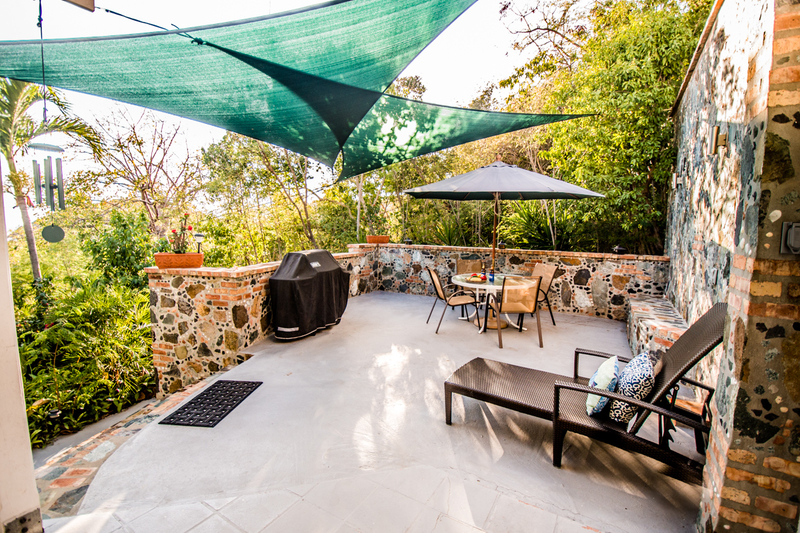 The Garden Suite at Chocolate Hole is a great choice for travelers looking for privacy, an incredible outdoor living space and comfort, all while being close to town. We can almost guarantee that you’ll love the Garden Suite at Chocolate Hole so much, you’ll be booking your next trip before the ferry leaves the dock! It was our first time staying with Island Abodes (July 29 – August 7) and we could not have been happier with our week at the Garden Suite. A perfect set up for a couple on vacation, the suite was neat and clean and comfortable. Surrounded by a beautiful landscape, it feels like you are living in the middle of a tropical garden. Even with the upper level suite being rented, it was quiet and serene. While we didn’t use the kitchen, it was well stocked with everything you would really need on a vacation. The supplied shampoo, conditioner, body wash and bug spray was a nice touch and make for light packing. The location of Garden Suite was a real plus, making for a short ride into Cruz Bay for a quick arrival to Happy Hour and evening dinner experiences. With each trip, going to St. John gets easier and easier for us. Now that we have stayed at an Island Abodes property, our search for rentals will begin with you. Thank you for your amazing hospitality. It was great to run into you on the island throughout the week. We appreciated knowing the property owners lived on island and could quickly respond to any questions or concerns if they arose. We look forward to our next planned trip back and to our stay at another Island Abodes property, Papaya Suite. 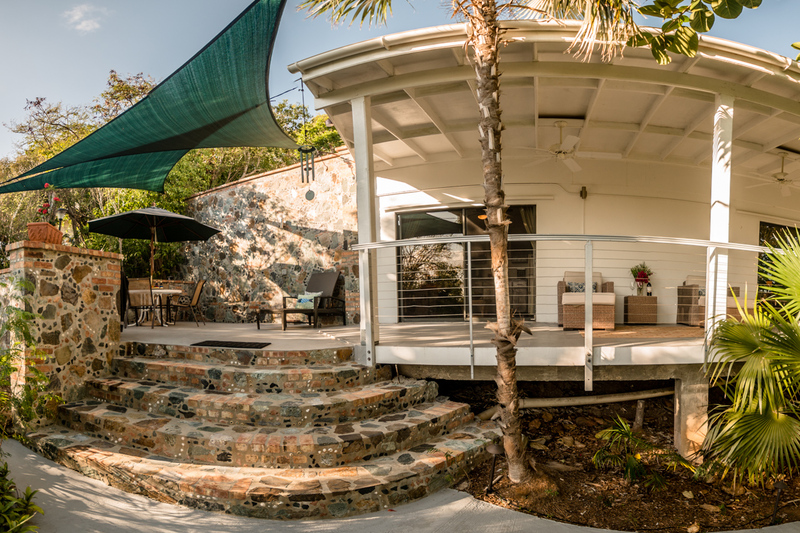 We just spent a week in the Garden Suite at Island Abodes and we absolutely LOVED it! It is charming and feels very secluded even thought it is a short drive into Cruz Bay and just 5 minutes from St. John Market. It is an easy drive to town and the beaches! The Suite is warm and inviting. 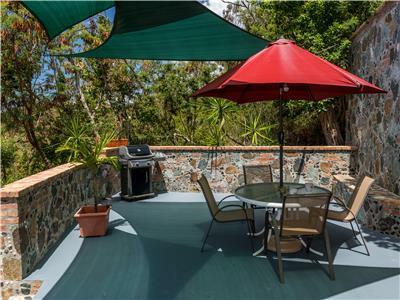 It has an amazing deck with gas grill and outside seating. We couldn't have been more pleased with the accommodations! As happy as we were with the suite, we were even more delighted with Brittany, Robert and island baby RJ! They are amazing hosts and provided all that we needed for a great stay including beach chairs, cooler, towels, and snorkel gear. They are so helpful and offer lots of good tips and places to see while there. Happy to say that we met as renters but left as friends! 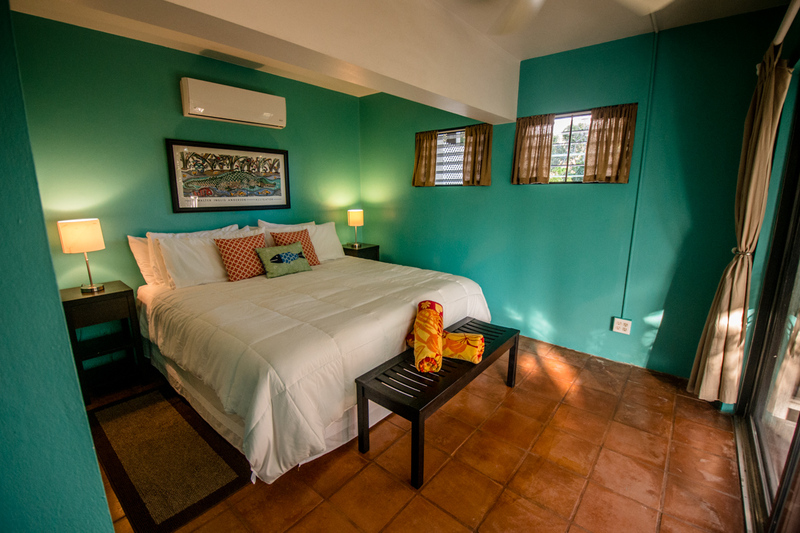 Hands down, Island Abodes offers great affordable choices to stay on island! We loved our time there! The Garden Suite was perfect for my visit. Everything you need for two people. The landscaping was beautiful and well kept. The owners are very responsive. Enjoy! The Garden Suite is the perfect spot for two people! 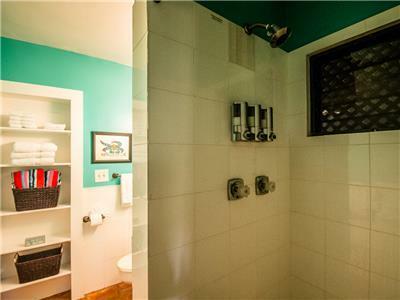 It is centrally located on St. John with a quick 10 minute drive to Cruz Bay. The suite itself is great. It is surrounded by various tropical trees but still has beautiful view of Chocolate Hole. We especially loved the outdoor space. We enjoyed using the grill and having a cocktail on the patio. 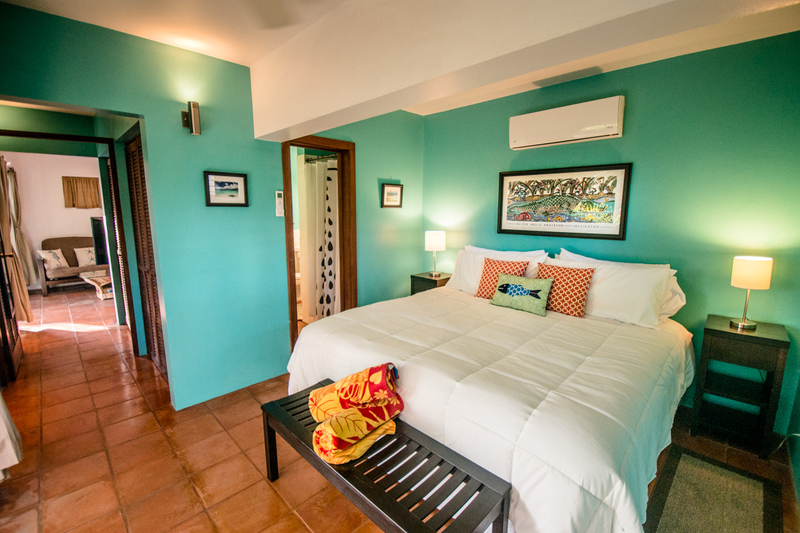 The Garden Suite has snorkel gear, beach chairs, sunscreen, full kitchen, and an amazing king size bed. Brittany was so accommodating and attentive. She has great advice on everything Virgin Islands related. I would highly recommend staying here! We will definitely be back. My sister and I had a wonderful stay in June 2018. I stayed at the Garden Suite before the hurricane and after and it was wonderful both times! The Garden Suite has a fantastic kitchen with everything we needed. We enjoyed cooking at the suite and also going to town. Longboard, Lucky Chops, Greengos, and Sun Dog Cafe are open and fantastic! We were so surprised how beautiful the beaches looked. Honeymoon still had a lot of palm trees and a good bit of shade. The Maho sea turtles are also back! All of our favorite hiking trails are also open. St. John is ready for visitors! Come see for yourself! Thank you Robert, Brittany, and RJ for a great time! Thanks Anna for the great review of the Garden Suite at Chocolate Hole! We are happy to hear that you were pleased with your stay. We always strive to give our guest the best experience possible while on island. It sounds like you made full use of the kitchen in your suite! You hit some of our favorite places while you were here. We can't wait to have you back on sunny St. John very soon! Being visitors to St John for many years, this was our first stay at Island Abodes Garden Suite. As we have never rented a vehicle while on St John, Brittany was kind enough to pick us up at the ferry dock when we arrived. When we first arrived at Garden Suite, Brittany provided a brief tour of the villa. We found our stay to be very relaxing, totally enjoying the views of the Caribbean from our porch starting with breakfast every morning. The amenities provided in the villa were plentiful and very appreciative. Being a short drive to Cruz Bay, we were able to connect with a very reliable and flexible taxi driver, who took us where we needed to go. The beach chairs provided along with the beach towels came in handy while exploring different beaches. We made good use of the kitchen and outdoor table, beginning with breakfast everyday. When not eating out in Cruz Bay, the outdoor grill came in very handy. When retiring for the evening, we found the bed to be very comfortable and the ceiling fans along with tropical breezes kept us comfortable. This was our best visit to St John, as we were able to take advantage of more opportunities being so close to town. We thoroughly enjoyed our stay at Garden Suite, and are already looking forward to our return visit in 2019. Kevin, we are so happy to hear that you had a great experience while staying with us at the Garden Suite in Chocolate Hole! Thank you for taking the time to write a review. It sounds like you made great use of the outdoor deck, including the grill and outdoor table. We are glad to hear that the beach towels and chairs came in handy! Thank you again, and we cannot wait to see you soon in Love City and at Island Abodes! Thank you Michael for the great review of the Garden Suite in Chocolate Hole! We are happy to hear that you enjoyed your experience back on island. It seems that you made full use of our kitchen while you stayed. We are pleased that you found everything you needed! (We love the food processor too!) We think that the view post hurricane is a great silver linning! We hope to have you back to Love City very soon! I love this place so much and would stay here again! This was the perfect spot. Great for one or two people. Everything was really nicely done and clean. The pictures are very accurate. I loved having a king sized bed. The indoor living area was just enough and the outdoor area was spectacular! It is surrounded by lovely gardens and is very peaceful. With the ceiling fans outside and a breeze, I was able to comfortably sit out there in the middle of the day and read or work on my computer. I will definitely be a regular to the Garden Suite for future trips to St. John. Thank you so much to my hosts, Brittany, Robert, and Paige who were so easy to work with. I've been coming to St. John for years, but mostly with a larger group. This was my first stay at a smaller place and it surpassed my expectations. Jackie, thank you so much for the lovely review of your stay at the Garden Suite at Chocolate Hole. We're thrilled to hear that the accommodations exceeded your expectations, and that you found the suite to be clean, well appointed, and comfortable. We love the island vibes of the peaceful outdoor gardens as well! We appreciate the kind words, as we strive to provide exceptional customer service to our guests. Looking forward to welcoming you back to Island Abodes on your next St. John vacation! 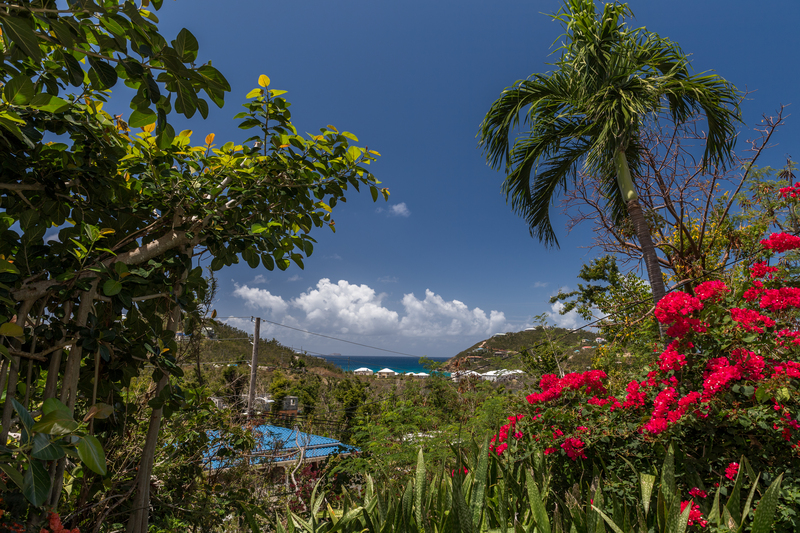 We had such a great stay at the Garden Suite in St. John! It felt amazing to come back to the peace and quiet of the property after being on the go all day long around the island. The property is just far enough out to enjoy some serenity but close enough to Cruz Bay to run into town for dinner or shopping. While on the island we hiked a few of the trails in the national park, took a day trip to the BVI, and also a sunset cruise. Cruz Bay Watersports is top-notch when it comes to those types of outings! Definitely one of the best vacations I have ever been on!! Jason and Linda, thank you so much for your review of the Garden Suite at Chocolate Hole! We are so happy to hear how much you enjoyed the peacefulness of the location and that you found the suite to be a quiet oasis to return to after busy days adventuring around St. John. I love hearing about the many fun outings you went on during your vacation, and we are so thrilled that Island Abodes helped make this trip one of the best yet! We hope to welcome you back to paradise soon! This place was amazing, beautiful, relaxing, private but safe, you’ll love the sliding doors and ceiling fans with chaise lounge on the deck. The house is close to everything you’ll need to get to. You won’t need to be at the foot of a beach because the view is incredible. Beach hopping from this location is very easy and the dock at Cruz bay is very close as well. We rented a Jeep (which I recommend).Expect to be amazed by the space. We had everything we needed including other amenities (snorkel gear, beach chairs, washer, dryer, ample supply of towels) and the bed was wonderfully comfortable and huge. Brittany was an exceptional host! I can’t emphasize that enough. She responded promptly to our communications with her and gave us a lot of suggestions of things to do and where to go; ended up trying a few of them. I highly recommend staying here. We can’t wait to go back and we will be contacting Brittany when we do. Thank you so much for your review and recommendation! Robert and I truly appreciate the kind words regarding your stay, the Customer Service provided, and the amenities at the house that helped you enjoy your days! It was no problem to provide suggestions for you guys - we just want to ensure you have the best time during your stay on St. John! You were a pleasure to host and it was so nice meeting you. Thanks again! We had a great stay. And when the dryer was not working Brittany took the time out of her day to drive down to the house and take our clothes to be dried at her house and then returned them folded! Tony, I'm thrilled you had a great stay in the Garden Suite at Chocolate Hole! Robert and I strive to provide high quality customer service for our guests and you'll be happy to hear the dryer has been fixed! We hope to welcome you back for another stay with Island Abodes on your next St. John vacation. Many thanks for your review and for posting it on VRBO! Here at Island Abodes we love nothing more than to hear you say you had an amazing stay with us. We're glad you enjoyed the Garden Suite, its convenient location and the amenities that came provided. 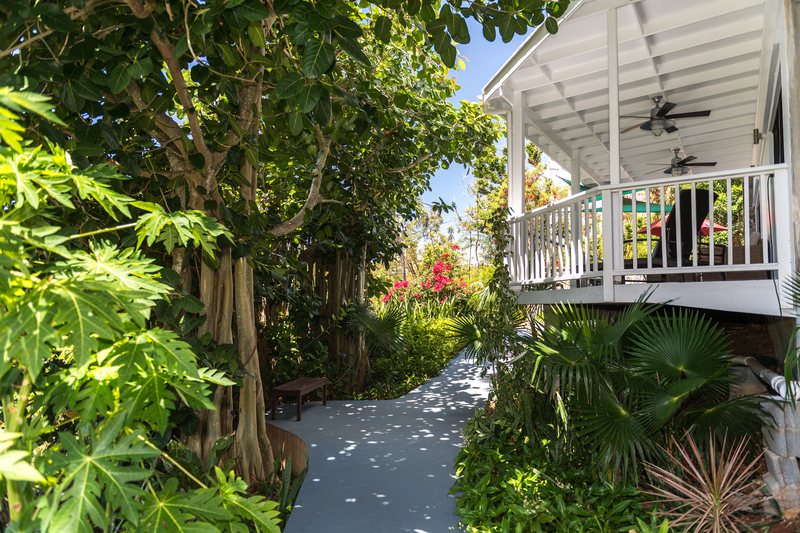 It sounds as though you took full advantage of all the Garden Suite has to offer, and we're just honored to have been a part of your relaxing stay on St. John. Thanks again and we hope to see you again soon! A nice apartment for a couple. The inside is small but has everything you need and the outside patio is large and beautiful. 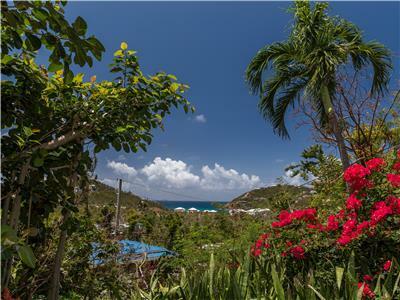 Lots of gorgeous shrubbery and a beautiful view of the Caribbean. Very private setting. We would definitely recommend it. Kay, thank you for the review and recommendation of the Garden Suite at Chocolate Hole. It sounds as though you enjoyed taking in the gorgeous Caribbean views from the outdoor private deck and that you found the suite to be well stocked with amenities. We hope to welcome you back for another stay with Island Abodes soon! What a great property. Just a mile or two out of downtown, the Garden Suite provides plenty of charm and opportunity to relax and stay cool. 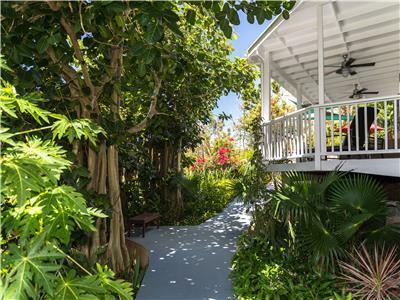 The best part is undoubtedly the twisty back walk that leads you past a tree of friendly iguanas and other tropical flora to a massive back porch and patio that has a view of the distant waters. The bedroom with AC and adjoining bathroom is nice and clean and the kitchen gives you some flexibility to cook at home if you want to. The only negative is the lack of a dresser for your clothes. Overall, thumbs up!! Thank you for the review of your stay in the Garden Suite at Chocolate Hole, Brian! It sounds as though the accommodations quickly became your island home away from home. I love to hear how much you embraced the beautiful tropical setting! Robert and I appreciate your feedback and will certainly take a look at storage options for clothing. We hope to welcome you back for another stay with Island Abodes during your next visit to sunny St. John! Perfect place to stay on St. John. Convenient drive to town but felt secluded due to the lovely tropical landscape. Communication with Brittany was outstanding with almost immediate response. We especially enjoyed the outdoor patio area but could have used better lighting when barbecuing. Kitchen was nicely equipped. We didn't run the a/c during our stay because there was a nice breeze. We will definitely stay here when we visit St. John again. Karen, many thanks for taking the time to write a review of your stay in the Garden Suite at Chocolate Hole! I’m so happy to hear you found our accommodations to be your island home away from home, offering a convenient location while providing you with a private tropical escape. As small business owners, Robert and I strive to provide excellent customer service to our guests, so we appreciate the kind words! 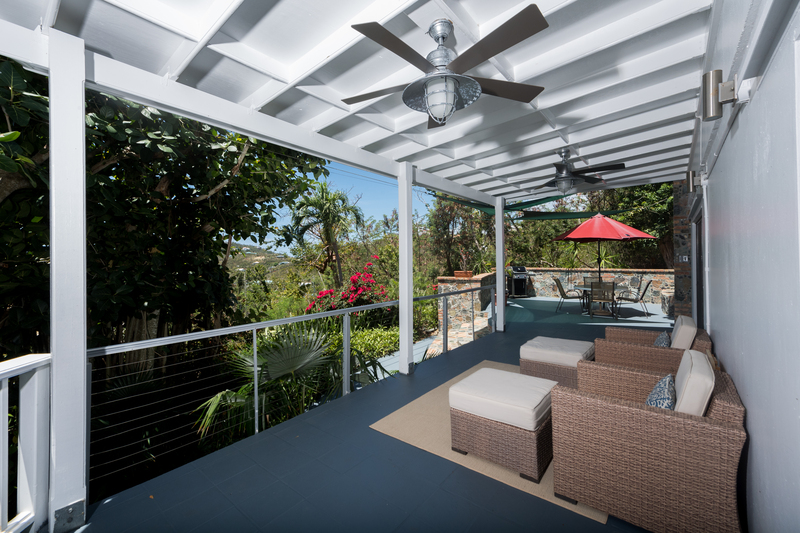 It sounds as though the outdoor deck was a big hit; it is certainly a necessity for island living! We will certainly take a look at the lighting near the grill. We can’t wait to welcome you back to Island Abodes for your next visit to sunny St. John! I can't say enough about this trip! It was everything I was hoping for and more. The garden suite was absolutely breath taking, there were a few days we never left the deck! Im definitely planning a return trip and unless my ears were failing me I believe I heard a pool above me!! Thank you for a wonderful vacation! Sonya, thank you so much for the splendid review of your stay in the Garden Suite at Chocolate Hole. We are so thrilled to hear how much you enjoyed the accommodations, especially the spacious and lush outdoor living space, which offers a true island experience! Your ears were not mistaken; you'll have to check out the Down Yonder Pool Villa on your next visit to sunny St. John! We can't wait to welcome you back to Island Abodes for another wonderful vacation. The place was nearly exactly as expected and just lovely! It was as peaceful, modern and picturesque as the pictures showed and even more comfortable than we could have imagined. It had a perfect set-up with a super comfortable bed and a luxurious lounge space outdoors. The rain-head shower was luscious. The kitchen was fully equipped. There was TV and internet for those quiet evenings indoors, but also being very close to Cruz Bay it was just a quick 5 min drive into the small city for a night on the town. It was definitely well worth the price and Brittany and Robert were fantastic hosts. The only thing that was unexpected was a little road traffic noise, but by being centrally located on this small island it would be impossible to get away from the road noise entirely. On an evening it was nice and quiet when the traffic was low. We would certainly stay here again. Thanks Brittany & Robert! Many thanks for the lovely review of your stay in the Garden Suite at Chocolate Hole, Jill! I am so happy to hear that the suite accommodations and tropical outdoor space exceeded your expectations. Vacations should be filled with comfort and luxury! 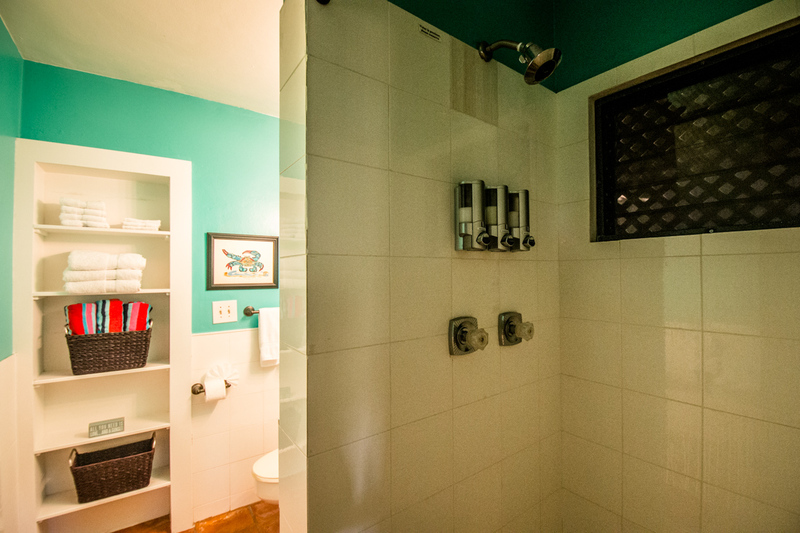 The rain-head shower is one of our favorite features, too! I love when our guests are able to utilize the various amenities provided to enhance their experience. Robert and I are thrilled that you enjoyed the Garden Suite and its convenient location. We hope to have you visit us again in Love City soon! Thanks again! I stayed at the Garden Suite with my wife and toddler. The property is not within walking distance of downtown or the beach, however, we found this to be a non-issue.....AND we saved a ton of money! Garden Suite is a quick taxi ride to downtown, or a short drive by rental car. Our first trip to St. John we stayed downtown, without a rental car, and really didn't get to explore the island. We found that renting a jeep was the only way to go. All the really good beaches are on the North shore and there are a ton of things to see that require transportation. Our experience staying at the Garden Suite was fantastic. The property is located right below the owners house, but is totally separate, private, and very quite. The owners are absolutely wonderful and provided a lot of added value to our trip. Brittany and Robert provided advice on everything you need to know to have fun and save money at the same time. Brittany was enthusiastic and happy to help us navigate all the choices---food, sites, beaches, etc. I found this personal touch to be invaluable! The apartment is very nice and very clean. There is a full kitchen with a Ninja blender and Keurig coffee maker, and all the stuff you need to eat at home---eating out every meal on St. John will cost you more than accommodations or airfare. 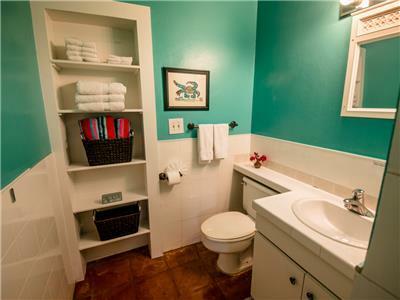 The bathroom is spacious and has everything you need. The property is up on a hill and gives you a view of the bay (Chocolate Hole) from the balcony, which is absolutely fantastic. The balcony is beautiful with lots of stone work and is the entire length of the apartment. 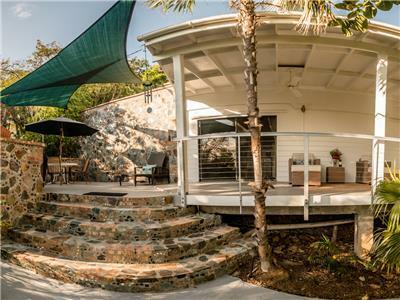 It has all the furniture you need to relax and hang out, and has a BBQ grill as well. The owners also provided snorkeling gear, beach chairs, and a cooler. Great property and great customer service...we will definitely be staying here again on our next trip. Thank you for your detailed review Mike! We're glad you and your family enjoyed your stay at the Garden Suite and found it to be clean, spacious, and fully stocked. We're also glad you enjoyed the private location and sunset views! Thank you for including so many details about your stay with us. We know future guests will appreciate it. Thank you again and please come back to see us very soon! Brittany met us upon arrival and gave us a quick tour of the space and over view of the How To's. She graciously provided us with 2 local beers and some snacks, which was much appreciated after a long journey. We enjoyed the privacy and quiet that the Garden Suite provided. We loved the location. Thanks for your review Ana! We're glad you guys enjoyed yourselves and it was our pleasure to ensure you had everything you needed and were well taken care of throughout your stay. Thanks again for your feedback and for choosing Island Abodes! I enjoyed the cozy atmosphere and garden setting of the suite very much. Brittany provided all the information I needed for my stay - she may the entire experience very easy. I had everything I needed during my stay. St. John is a beautiful island - I would love to return and would be happy to stay at this location again! Many thanks for the great review Rebecca! Robert and I really appreciate your feedback and were happy to read that you enjoyed your stay with Island Abodes. It was truly my pleasure to make your experience on St. John as easy and enjoyable as possible, and we'd love to have you back. Thanks again and we'll see you soon! I had an amazing time at the Chocolate Hole Suite! Brittany and Robert were very hospitable and professional. The location was great. There was a lovely view of the ocean from a private spacious patio. You can stay here without a car, but prepared to either get to know a taxi driver or walk ten minutes to the Westin to grab a taxi. It was far more reasonable to just grab taxis when you need them in lieu of renting a car. The suite was very spacious and ventilated well. There is an AC unit in the bedroom. The bed was very comfortable and so was the futon for the brief moment I sat on it. The covered patio with a water view was so nice that all of my time lounging was spent there. The kitchen was fully equipped and the grocery store was a ten minute walk. You can grab a taxi flying by to get back to the suite should you need it. If you are looking for your own little slice of the island this is it. I travel quite a bit and this place stacked up and surpassed my previous experiences. You will have more than what you need in a tranquil and well cared for location. Thank you again Brittany and Robert for an amazing trip! This unit was a wonderful base for a lovely week on St. John. 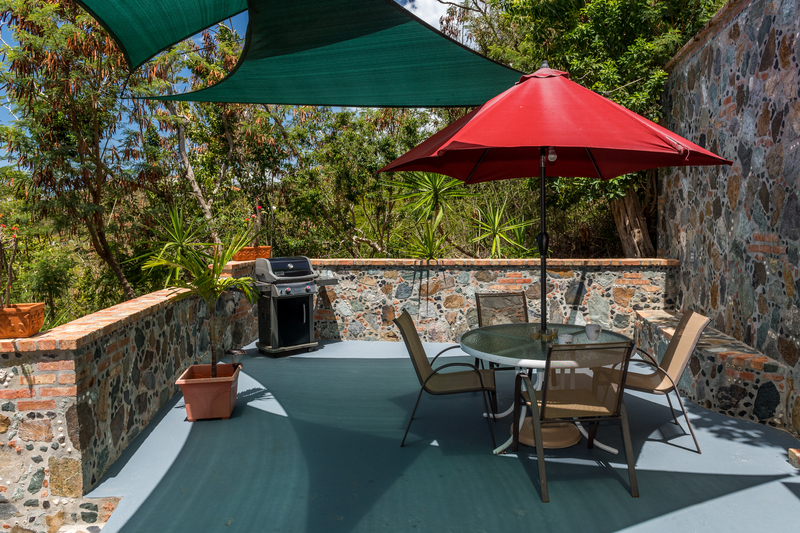 It's a private spot in a quite residential neighborhood only a short taxi ride from the "bustle" of Cruz Bay. Brittany was a great host and- since we decided to not rent a car- was kind enough to pick us up at the dock and bring us back when it was time to leave. She even suggested a stop at the grocery (and liquor) store on the way to the house- which was key to making good use of the facilities, allowing us to make breakfast and enjoy it on the expansize porch each morning. I wouldn't hesitate to book another stay with Island Abodes. Hi Clifford! Thanks for taking the time to post a review regarding your stay with us! It was my pleasure to pick you and your lovely wife up from the ferry dock! Robert and I were happy to hear that you enjoyed your stay and found the apartment clean, cozy and convenient. Thank you again and we hope to see you next time you visit our beautiful island! Hi Laura! Thank you so much for taking the time to post such a wonderful review on Airbnb. Your kind words regarding your stay are much appreciated and we sincerely enjoying having you three stay with us. It sounds as though you enjoyed your accommodations, the included amenities and the location of the apartment. We do our best to always be available for our guests without being intrusive. We know our guests sometimes need suggestions and guidance, and we want everyone to fall in love with St. John just like we did. Thank you again Laura. We appreciate your review and recommendation. We look forward to welcoming you back in the future! I LOVE this place in Chocolate Hole! Thank you Katie and thank you for choosing to stay with us again!! It was great seeing you and Robert and I always rave about what a great guest you are! Thanks for posting such a great review and for providing so many details about the property. We look forward to your next visit! Excellent accomodation! Everything you need including easy parking, great hosts, garden setting and great outdoor sitting/dining area. Great for couples. Easy drive to Cruz Bay and attractions beyond. Thanks to Robert and Brittany for tremendous hospitality. I would definitely stay here again. Can't wait for our next trip. Thank you for your review! Robert and I were very happy to hear you enjoyed your accommodations, convenient parking and outdoor space! It was our pleasure to assist you and we hope you'll stay with us again during your next trip to St. John! Thank you again! This villa was truly perfect for my wife and I. We practically lived on the patio! 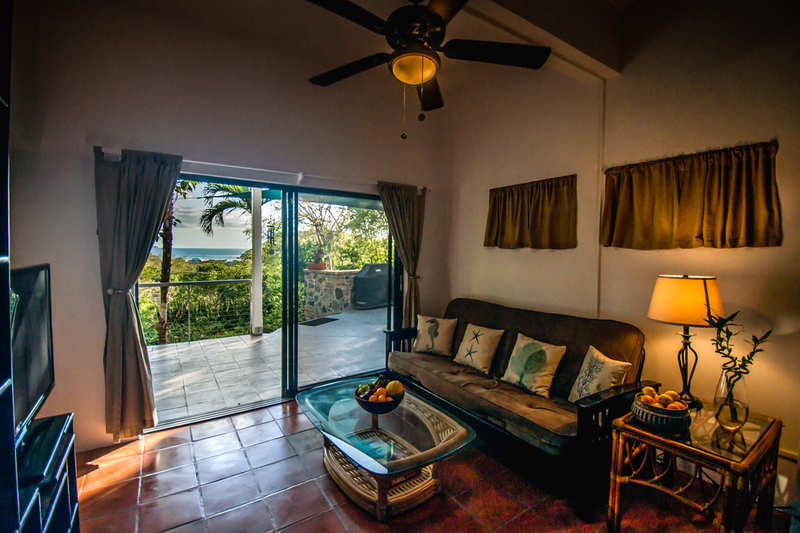 The outside living area was extraordinary with lush landscaping, great seating, tropical breezes, and an ocean view. The ceiling fans on the patio were great for deterring mosquitos. The unit felt private and had a wonderful location with easy access to town (some road noise). It was clean and well maintained. The washer and dryer were a great plus! We definitely would stay there again! Also, an added treat was the fresh papayas from the garden! Best Yet! All Around Perfect!! This was our second trip to St. John. First time we stayed in a villa overlooking Coral bay and thought that could not be beat. We decided on a last minute birthday celebration and were lucky enough to find this place. I am so glad we did. The location is so convenient and close to the beaches, town, groceries, gas and anything else you might need. There is a great view. The apartment is very comfortable and spacious for two people. Robert was an incredible host with recommendations when we asked and quickly responsive to any questions or needs. We did not cook this time, but everything you would need to prepare a simple meal was readily available. We loved being close to town. The apartment was easy to access, not three or four flights of very steep steps or hills as we previously had to deal with. The grounds are beautiful and well kept. I can't say enough. In fact, I almost did not want to submit a review because we want to come back and are afraid it will be booked. We are coming back in August with two or three friends and do hope to stay in the property above this apartment. (There was another couple and child in the property above us during our stay. We would not have known that had Robert not told us. We did not hear anyone or see anyone during our stay. (We knew they were there only because we saw their Jeep). Thanks Robertl for a great stay in our favorite place. Thanks for your kind words and great review! Both Robert and I were very glad to hear just how much you enjoyed your stay with us and that you found the accommodations perfect for your birthday celebration! It sounds as though you truly enjoyed the space, view and convenient location. We can't wait to welcome you again! Thank you! Very nice and no complaints! We have gone to St. J often and stayed at various locations, including other villas, Caneel Bay and Westin. I found this villa to be an excellent option for a couple (max 3 people if you use the futon in the LR). It was good to have a kitchen because eating out all the time is very expensive in St. J, and having a full kitchen plus the outdoor grill was perfect. Kitchen has all basic needs. The property isn't too far from all the beaches (sits on a main road), but you will need a car (we rented ours in St.T and took car-ferry to St. J). Villa is close to grocery shopping. About 5 min. from Cruz Bay and 15 min. to Trunk or Cinnamon Bay. Robert was very attentive and available. Overall, a very nice place to stay. Thanks, Robert! Thank you for your review! Both Robert and myself were so happy to hear just how much you enjoyed your stay with us, especially since you've traveled to St. John many times and have experienced many different accommodations. We're honored to be one that you consider an excellent option and were glad to hear you enjoyed the kitchen and grill - we agree that sometimes eating in and saving a little money is the way to go! Thanks for including the details regarding the distance to the beaches, shops and town. We do hope you'll consider staying with us again upon your next trip to St. John - we'd love to welcome you back! I took my daughter to St. John on a last minute senior trip and I am so happy we stumbled upon this villa. The space was perfect, the views are gorgeous and the patio is to die for. We would hit a different beach each day with our picnic lunch, beach chairs, towels, and cooler, thanks to the thoughtful owners we had everything we needed. After our long days of exploring the beaches/town we would return to the villa to relax with a good book on the patio and a glass of wine (for mom). I highly recommend this villa and St. John, everyone we met was so gracious and kind, many thanks for the wonderful memories! Thank you for posting a review Melanie! We were so happy you and your daughter stumbled upon our villa too, we truly enjoyed having you and we glad to hear you had everything you needed to enjoy our little island. Thank you for the recommendation and we hope you and your daughter have a new tradition and come see us every year! We'd love to have you. I had an amazing time at the Chocolate Hole Suite! Brittany and Robert were very hospitable and professional. The location was great. There was a lovely view of the ocean from a private spacious patio. The suite was very spacious and ventilated well. There is an AC unit in the bedroom. The bed was very comfortable and so was the futon for the brief moment I sat on it. The covered patio with a water view was so nice that all of my time lounging was spent there. The kitchen was fully equipped and the grocery store was a ten minute walk, less than two minute drive. If you are looking for your own little slice of the island this is it. I travel quite a bit and this place stacked up and surpassed my previous experiences. You will have more than what you need in a tranquil and well cared for location. Thank you again Brittany and Robert for an amazing trip! Perfect Location and 5 star porch! This was my first trip to St.John with 2 girlfriends. With minimal knowledge about the area, we stumbled upon this little oasis in Chocolate Hole. The first thing we said was "This is so much better than the photos!". That's a rarity in the real estate world. Brittany mentioned they try to manage expectations--but I can promise the view is even more spectacular in person. The price couldn't be beat for the accommodations. Clean, well kept, spacious patio and such a great location. So close to a great little market and Cruz Bay (with bars, shops and restaurants). Robert and Brittany were fantastic with correspondence and response times. They recommended renting a jeep (a must for the hills!) and gave us ample suggestions for beaches and restaurants. They even had sunscreen, bug spray, extra beach towels and laundry detergent too. Those simple amenities made it so much easier for us. As you can tell by their other 5 star reviews, they are wonderful hosts and we cannot wait to visit again! Hi again Eloise! Thanks so much for your 5 star review. We were honored to be a part of your first trip to St. John and thank you for the kind words regarding your stay! We try to provide everything our guests may need and were happy to hear you found the apartment convenient, clean and well stocked. We hope we make the cut for your second trip to St. John! The view will be waiting for you! We took a last minute trip on Memorial Day weekend and Brittany and Robert were incredibly accommodating. They worked with us to make sure we were well taken care of during our vacation. Brittany was quick to respond to any question before and during our stay. They helped make our first trip to St. John a wonderful experience, and we definitely want to visit again soon! We would definitely book with them again. Thanks for your review Josh! We were happy to help you during your first visit to St. John and were delighted to hear you felt well taken care of and enjoyed your stay. We hope to see you again soon! Thanks again. Robert and Brittany are so friendly and accommodating - they've truly thought of everything you might need during your stay (complete with fresh mangoes from their yard upon arrival). 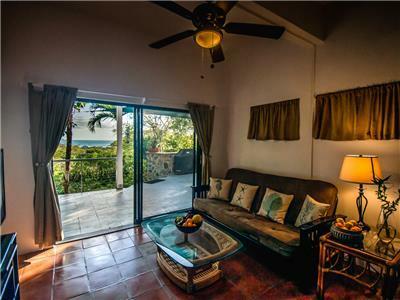 The villa is close to Cruz Bay, but in a quiet location with a beautiful view of the ocean and spectacular outdoor space. Clean, comfortable and beautiful all around - would recommend highly to anyone. We were so glad to hear you had everything you needed during your stay and that you enjoyed the yummy mangoes! It sounds as though you found the villa comfortable and convenient and we can't thank you enough for your recommendation! Thank you for taking the time to post a review and we hope to see you again in the future. Helpful owners, lovely patio and comfortable beds! Great space and Robert and Brittany were amazing from start to finish, with great beach/restaurant recommendations and helpful tips on navigating our departure through the July 4th festivities. Highest recommendation! Hi Emily! Thanks so much for posting a review regarding your recent stay with us! I was glad to hear you enjoyed our local recommendations and that our tips helped guide you through a very lively and crowded time on St. John.. We truly appreciate your recommendation and kind words and hope to have you back to stay with us again real soon! Thanks again! Great space and Robert and Brittany were amazing from start to finish, with great beach/restaurant recommendations and helpful tips on navigating our departure through the July 4th festivities. Highest recommendation! This place is so amazing! Extremely close to town, close to grocery stores, and on the main road. I highly recommend renting a car if you want to explore the island on your own (we rented with Courtesy Rental and they picked us up from the Ferry Dock and dropped us off for no cost). The unit had a full kitchen, AC in the bedroom...which made the entire apartment cool if you stayed inside for most of the day. Please note, you should not leave the AC on if you are not in the apartment for the day because electricity is pretty expensive on the island. We left it off when we out for the day, but when we came back in, it made the entire unit comfortable enough to where I got a little cold at times! There is a Weber grill out on the patio which was great for the nights we wanted to stay in and cook. Robert and Brittany will replace the gas if you run out, we did not run out but Robert did let us know they would take care of that. Sitting on the patio at night was also such a great experience, yes the mosquitos can be annoying but as long as you have spray and have deterant lights on, you won't have an issue. This was such as great stay for the money, the view is great at night and during the day, and the short drive to town and beaches was awesome. The king bed was very comfortable. There were plenty of towels and even beach towels to take on daily trips. There is also a washer/dryer for guests which had detergent and even dryer sheets. Robert and Brittany also provided a big carry cooler which can fit plenty of cans/food/ice, this was essential compared to a bookbag if going on day long trips to the beach. They also provided beach chairs which are super helpful for beaches where towels are not comfortable enough (Francis beach which is a little elevated). Overall, we felt we had the whole place to oursleves, the outside patio had fans and lights and mosquito deterant lights at night which really helped prevent getting bit up at night. Although if u go during rainy reason, its a little inevitable that you will get bit just a little! A little bendrayl lotion or calomine lotion will help! This was such a great place to stay and had everything we needed! Eating out in STJ can be a litty pricey, so cooking breakfast in the mornings and having a big cooler to bring sandwiches to the beaches for lunch, went a long way! Thank you Robert and Brittany for the wonderful accomodations! We'll be back soon!!! We can't thank you enough for your wonderful review Elma! We truly appreciate you taking the time to leave a review and including so many details for our future guests! It sounds as though you enjoyed the villa and the island overall, other than those pesky mosquitos! We were very glad to hear you enjoyed the convenient location of our villa and the many amenities that we include to make your stay more enjoyable. As Owners and local St. Johnians, we know sometimes travelers forget certain items and we do our best to make sure we provide you with anything and everything you might need! Thanks again for your detailed review - we look forward to welcoming you back! 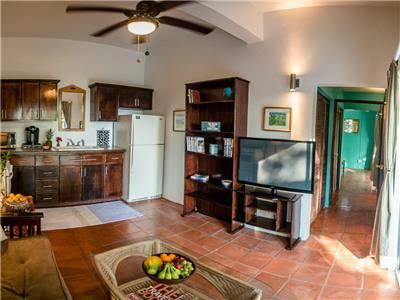 This apartment was perfect for me and my wife while staying on St John. Brittany was very helpful and even picked us up at the ferry. The apartment is clean and cozy, close enough to town but very private and quiet. Awesome view, very clean, has everything you'd want or need. Worth every penny. Thanks Caleb! We really appreciate your review. We loved hearing that you had everything you needed during your stay and that you found the apartment clean and worth every penny! We look forward to welcoming you back and hope you'll consider staying with us again! Thanks again. What an amazing little place! Vacationing on St. John was so easy and relaxing, and staying at Brittany and Robert's place only made our experience that much nicer. The apartment was filled with things to make our stay more comfortable: beach towels, bug spray, beach chairs, umbrella, cooler, washer and dryer, a Keurig machine, a stocked kitchen (including spices and Rubbermaid containers), plenty of fans for air circulation, an AC unit, and a Roku (with subscriptions!). The layout of the apartment was great, everything was clean and tidy, and Brittany was always in touch and happy to answer any of our questions. We had a great time! Sarah, so happy to hear how much you loved the Garden Suite at Chocolate Hole! It sounds as though you really enjoyed the variety of provided amenities; Robert and I try to think of everything we like to have in a vacation home and then supply it for our guests! I'm so happy to hear how comfortable and relaxing your stay was, especially since you were celebrating such a special life event! We hope to welcome you and your newest addition back to Island Abodes in the future! Gorgeous Views, Amazing Porch, Wonderful Apartment, Very Clean! This villa is truly amazing. Brittany & Robert were excellent hosts! We had originally planned on staying at their smaller studio on the island and Brittany and Robert were very gracious to call us and offer a free upgrade to this unit because the A/C had not been fully installed in the Studio yet. We were so surprised and excited by their generous offer. Suffice it to say we will certainly be back! The porch is huge, and had two ceiling fans to help to keep any mosquitoes away. The view truly is more spectacular in person than the photos show. The ocean view is great, and you are otherwise surrounded by beautiful trees in the garden area. There are full-time residents upstairs--but you will never hear them. There is a full size gas grill and table on the porch as well. The kitchen inside has everything you might need from a Keurig to a toaster, basic spices, pots and pans, cooking utensils, etc. We did chose to bring some of our own food--and cooked a lot of the grill. The grocery store in town has any meats or produce you will otherwise need. The bed is very comfortable and the bathroom is very clean! Brittany also made sure we knew that the 2-chairs, umbrella, and cooler were for our use--and put out more beach towels (above the 2 already supplied) for us because we didn't bring any! 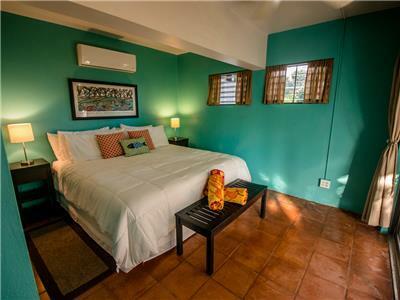 Overall, wonderful, peaceful place to stay that is a very short drive into downtown Cruz Bay and the North Shore beaches. Brittany and Robert were always a text away for suggestions on where to eat, or where to get rentals. I couldn't recommend this place more highly, and am sure that any stay with Island Abodes would be similarly wonderful! Thanks for your review Katie! It was our pleasure to provide you guys with a complimentary upgrade - we always want our guests to have the best we can possibly give, and we were so glad to hear you enjoyed your stay with us! The view is my favorite part of the apartment too, so it made us happy to hear you say it was even better in person. Thanks again for your kind words and details regarding the accommodations and the island - it sounds like you had a wonderful time and had everything you needed. We hope to see you again very soon and once again welcome you as a guest of Island Abodes! The Chocolate Hole suite was the perfect stay on my recent visit to STJ. It had all of the amenities that I needed including the A/C in the bedroom, which was a MUST. It was nice to have access to a full kitchen and quick coffee on the go. The porch even had a small view. I loved being a short distance from town and all that Cruz Bay offers, while still enjoying the peace and quiet. Thank you Brittany and Robert for going above and beyond on my recent visit and for showing me true southern hospitality! Can't wait for my next stay with you! Happy New Year! Thank you for your review and for taking the time to share it on VRBO! It was honestly our pleasure to host you and we just like hearing that you had everything you needed (and wanted!) during your stay on St. John! We think the Garden Suite has a nice location too, so we're glad you found it convenient to town but also peaceful, as a vacation should be. Thanks again for sharing your feedback and giving us a great rating! We can't wait for your next stay with us either! We absolutely loved this villa. Its quaint, comfortable, and had everything we needed. The location is great - close enough to the center of town but far enough away to feel remote. Beautiful views from the deck. We were very satisfied with the whole experience and highly recommend Brittany and Robert as hosts and specifically this villa. Hi again Bruce! Thanks so much for sharing your feedback regarding your stay at the Garden Suite! It was great to hear you found it comfortable, convenient and well-equipped. We really appreciate you recommending us and we hope to see you again in the near future. Thanks again and Happy Holidays! We found a gem in St. John! Brittany and Robert's Chocolate Hole Villa was perfect for our family! We were traveling with an 18 month old and were in search of something convenient, quiet, and with all the comforts of home. We scored! We loved the location, it was easy to get to - in a nice area tucked just far enough outside of town, but not too far. We had all the privacy that we were looking for and we also knew that Brittany and Robert were easily accessible should we need them. 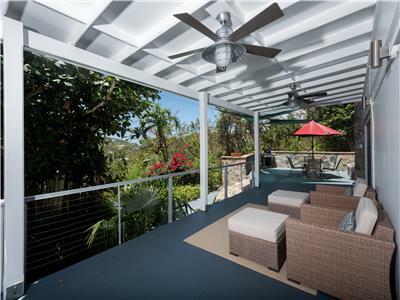 Nicely appointed house with a great deck and a view to top it off! My favorite touch was the extensive lighting system that Robert installed to light up all the walkways and native plants and trees around the villa. Magical! We had a great time in St. John and their villas will be the first place we look to book when we come back to St. John! Thank you! We loved having you and your family Jennifer! Thanks so much for your review and your kind words regarding your recent stay with Island Abodes. Robert loved hearing how much you liked the lighting in the garden and we are just so happy that you felt well taken care of, especially with your sweet baby. We truly look forward to having you back and promise to take great care of you every time you're on St. John! See you soon. Happy Holidays! After a girls trip and a travel glitch, I extended my stay in beautiful St. John for a couple of days. Brittany and Robert's Chocolate Hole Villa was perfect for me, and they were wonderful hosts. Brittany was incredibly helpful and went above and beyond my expectations by picking me up and dropping me off at the ferry. The Villa is tucked away on a hill and has a little bit of a view and lush surroundings. A quick taxi ride to town, AC, laundry, beach chairs, towels, a cooler...they thought of everything. Bedding was comfy, place was clean and spacious. I'm definitely coming back. Thank you for your wonderful hospitality. Cheers! My husband and I just returned from our trip to St. John and stayed at this property. We loved it. Brittany worked with us and provided a ton of information upon request. The suite was perfect for the two of us and included everything we needed. Our favorite part was the large covered porch where we spent a lot of time reading and playing games. The villa is a short drive from town and feels very private. We rented a Jeep and were able to explore the whole island. Thanks for your awesome review! It was absolutely no problem to provide you guys with tips and suggestions - Robert and I love this little island and we always do our best to make sure our guests have all of the information to enjoy it fully as well! We were so pleased to read that you found the suite perfect for you and your husband and that you enjoyed the spacious porch on a daily basis. It sounds as though you had a great trip and left feeling very relaxed and refreshed! Thank you again for sharing your feedback regarding your recent stay at Island Abodes. We hope to see you again soon Jessica! 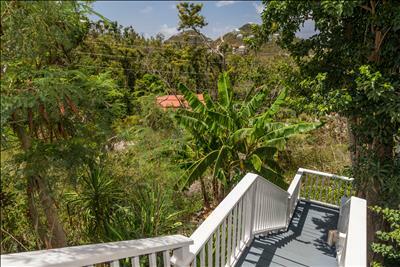 The garden suite is a great base to explore St. John from. It's private, comfortable and well equipped. The perfect place to relax... Brittany and Robert were were great hosts - friendly and available for questions or advice, but unobtrusive. Mark, thank you so much for taking the time to write a review of your stay in the Garden Suite at Chocolate Hole! It sounds as though the accommodations met all of your vacation needs. I'm so happy to hear you found the suite to be comfortable, relaxing, and well stocked with amenities. Robert and I strive to meet all of our guests needs, so thank you for the kind words! We hope to welcome you back to sunny St. John and Island Abodes again soon! Wonderful stay at Garden suite... beautiful amenities, very clean and comfortable and what a gorgeous huge deck! Thank you Robert and Brittney! You have a beautiful home and take such pride in your rentals! The little touches are what makes it amazing, the tiny earplugs on the night stand, the tea and coffee, everything I needed! I live on St. John and just needed a place to stay for a couple nights, but I will be sending all my future guests here! Thank you again! Lets start out with the fact that Brittany is a very nice person. If you have never been to St John and are unsure about how to make your way from the St. Thomas airport to your villa's front door she gives detailed instructions and then caters to you by picking you up at the ferry, taking you by the grocery, patiently waiting while you shop, suggesting fun activities and great restaurants, and just making your vacation easier. 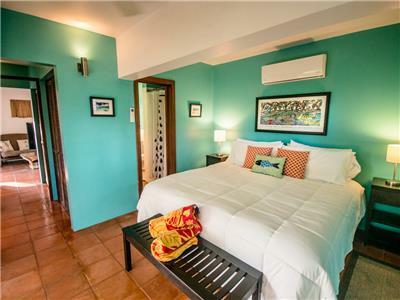 Hey and the garden suite is very comfortable, has a great tropical garden that is very well kept and, everything else you need for a comfortable relaxing stay. You can tell that she takes pride in making sure that her guests are enjoying themselves in a comfortable private atmosphere. I look forward to my return visit. Awww, thank you so much Perry! For both your review and your kind words regarding me and your recent stay at Island Abodes! Nothing makes Robert and I happier than to know that our guests are well taken care of from the minute they step off the ferry. It's our pleasure to ensure you feel comfortable and welcome right from the start, so thank you for appreciating the things that we do! It sounds like you really enjoyed your stay with us, and we look forward to seeing you again in the future. Thank you again for the great review and for taking the time to share your feedback! We chose STJ and the Garden Suite for our honeymoon - and boy are we glad we did. 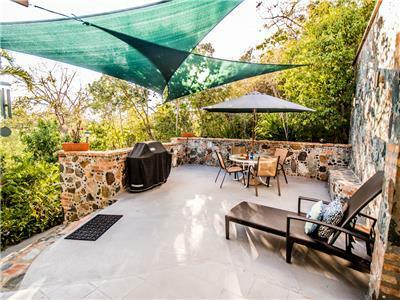 The property is absolutely beautiful, and the patio itself is beyond what we could have imagined. Gorgeous, private and so comfortable. The villa was super clean, nicely decorated, and had all the amenities: beach towels, suntan lotion, bug spray, an electric mosquito-swatter, beach chairs, beach cooler, etc. etc. We even did laundry mid-trip which was helpful. The kitchen is super equipped, too. We had an incredible stay and would book with Brittany and Robert again, for sure. Brittany couldn't have been any nicer or more awesome. After hearing our sticker shock at the prices of fruit at the market (groceries are generally pricey in St. John), and she had Robert pick us a papaya from one of their trees. Seriously, such a personal touch. Brittany was always available when we had a question, and kept us informed on ferry times and the like. These guys know what they're doing. :) The only things I'd advise to people is that there aren’t any bars or restaurants within easy walking distance and it's pretty difficult to get a taxi to pick you up. It’s possible to grab a taxi at the Westin, which is a 10-minute walk down the road. We had a jeep so it wasn't a huge deal, but if you want to go in to town for cocktails you really need to limit yourself if you’re the driver. Also, while this property is phenomenal (I gave 5 stars! ), it's definitely not an all-inclusive resort if that's what you're looking for. Great place for a couple. Amazingly clean, Paved roads, COLD A/C private and cozy. Has a great view from the deck we had dinner there every night. We will be back. Thanks for your review Jason! It means a lot to us that you enjoyed your time at the Garden Suite, especially since you know the island so well already! Robert and I are so glad we could provide you with a clean, comfortable, and most importantly to us islanders, a cool place to stay. We know you had a lot of options, so thank you for choosing Island Abodes! Please tell Kelly hello for us and we hope to see you guys soon! Thank you again. We just came back from our vacation at Island Abodes. Brittany picked us up at the ferry dock and advised on the best restaurants around. Her place was beautiful, with peaceful surroundings, very clean and close to town. The house was equipped with snorkeling gear, cooler and beach chairs, so we had all we needed to hit the beach. The house also had a Keurig coffee machine, which was a plus for us! The spacious deck makes for a laid back, relaxing evening to read after a day at the beach. Brittany was very helpful and great at giving us suggestions. We really enjoyed our stay and look forward to staying with Island Abodes again. St. John's has once again, surpassed our expectations. Thanks guys! Thank you so much for the great review regarding your recent stay at the Garden Suite! It was great meeting you guys and Robert and I can't thank you enough for taking the time to post your feedback and include so many details about the property and the amenities provided. We always love to hear that our guests have a wonderful time during their time with us, and we're so glad St. John exceeded your expectations once again! Thank you so much and please come back and see us again soon!